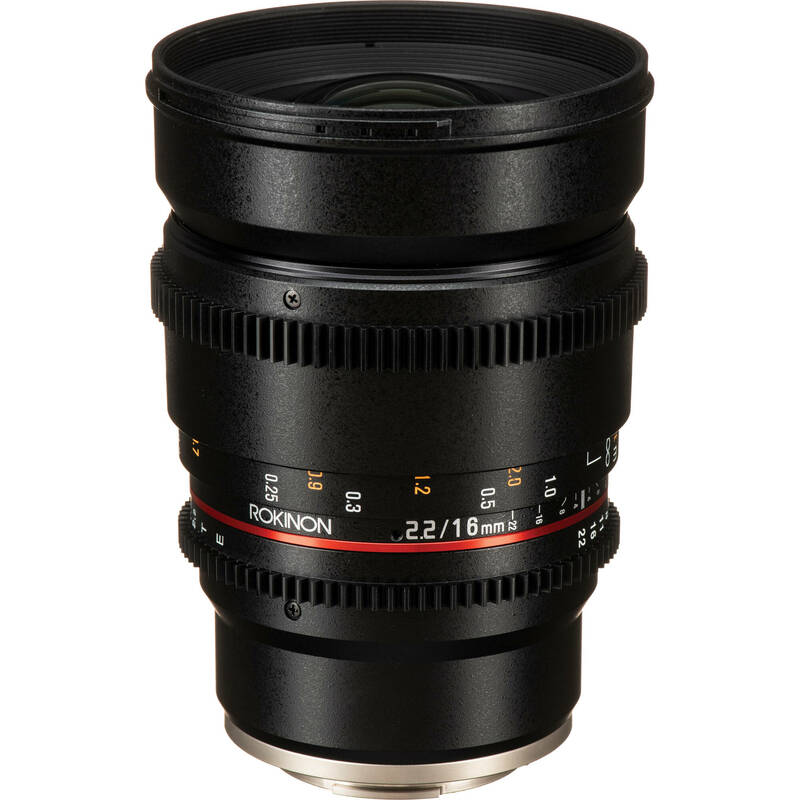 Utilizing a multi-layer coating process for consistent color rendition from lens to lens, the Rokinon 16mm T2.2 Cine DS Lens answers the challenge of assembling a set of lenses over time. The lens comes in Sony E mount, and it features industry standard geared focus and iris rings that share common position with other Rokinon Cine DS lenses. To aid focus pullers who have to work both sides of the lens, the aperture and focus scales are marked on both sides of the lens. This 16mm lens produces a 83.1° angle-of-view when used with a camera with an APS-C sized sensor. Hybrid aspherical lenses render sharply defined images with a minimum of distortion and chromatic aberrations, and it features a minimum focus distance of 7.9"' from the lens. A removable petal shaped lens hood provides flare protection when shooting without a matte box, and the lens's threaded front accepts 77mm filter rings. Industry-standard gearing for focus and aperture rings. Each lens in the Rokinon DS series share common focus and iris gear ring positions, which speeds up lens changes as accessories, such as follow focus units or iris motors, don't have to be re-positioned. The lens features an internal focus mechanism, so the front of the lens doesn't rotate when changing focus, allowing you to use filters and clip-on matte boxes without vignetting as you change (pull) focus. The lens features an 8 bladed iris that provides round out of focus highlights and a natural looking Bokeh. The declicked aperture ring allows for smooth iris pulls. The lens opens up to T2.2, providing the capability for low light shooting or creating shallow depth of field. Box Dimensions (LxWxH) 7.1 x 5.1 x 5.1"